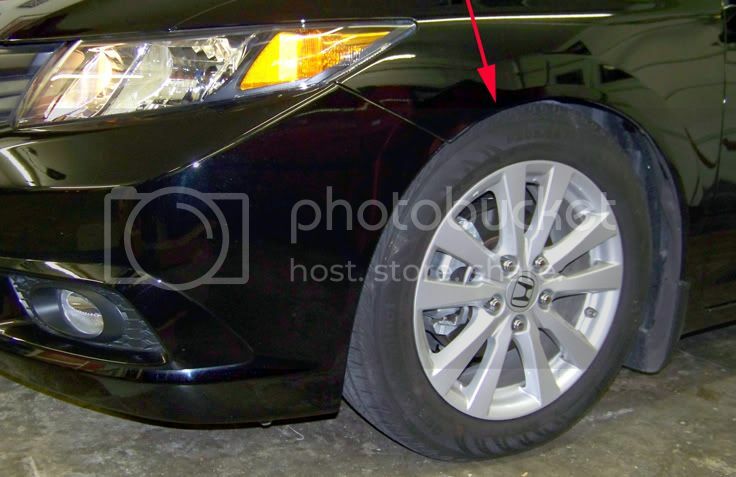 Alright boys andgirls today I figured I'd start my day off with a somewhat "simple" install for all you new proud owners of the loved and hated 2012 9th Gen Civic platform. I decided to do this to showcase the ease of the new platform along with any issues that may come along when doing your own suspension on these. 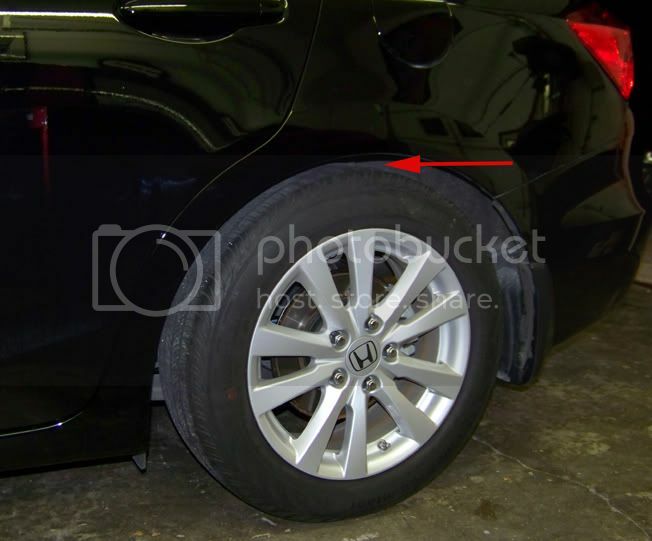 Our victim today will be Trung (Trung_Ej8_#579) here at the city who is the owner of a 2012 civic and wanted us to install a set of Eibach springs from an 8th Gen civic. So, just like any sexual encounter with a potential partner......I decided to start the civic off from the rear (sorry, early morning humor). Anyone attempting this on their own can pretty much start up in the front or whatever makes them happy. 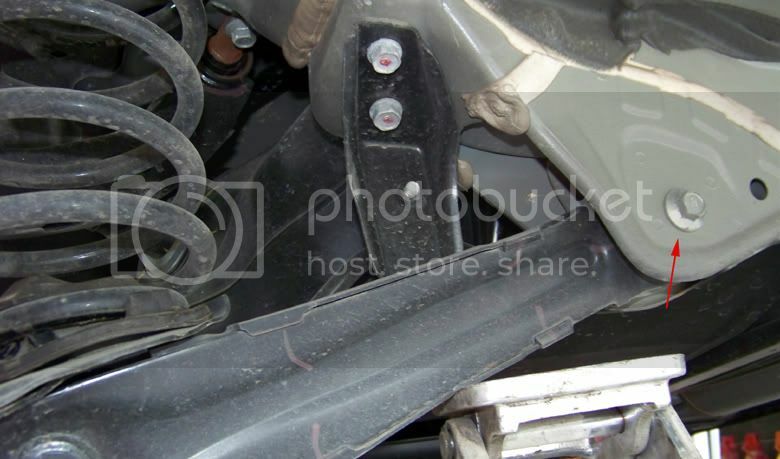 As usual make sure to support the vehicle on jackstands or any other hoisting source (is hoisting even a word?? lol sounds weird) anywho.......do the general removal of wheels, get yourself a pop or beer and get ready to lower this thing! 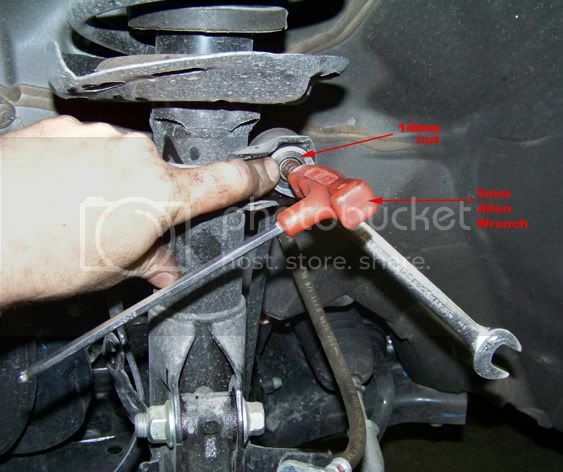 you'll need to start by removing the 14mm bolt pictured and ensure you have a free jack to support it while bolt is off. NOW, before we move to the next step PLEASE make sure that you have a jack underneath supporting the lower arm. 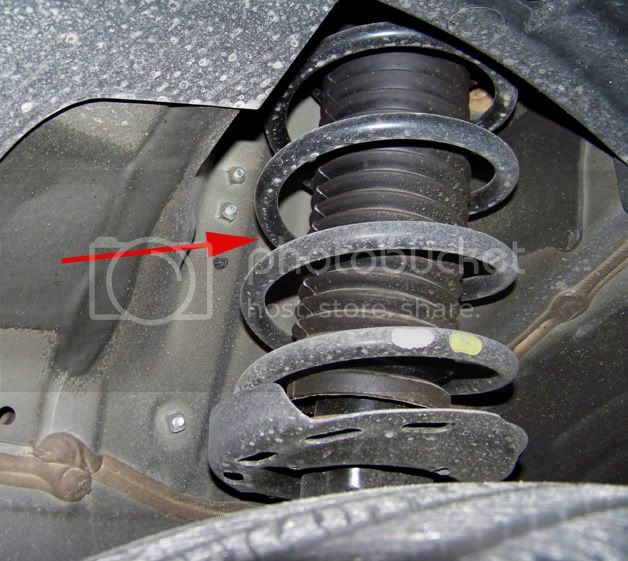 The reason is that the spring is still compressed between the body and LCA. So if you remove bolts without supporting it...WELL, read disclaimer up top in RED!! 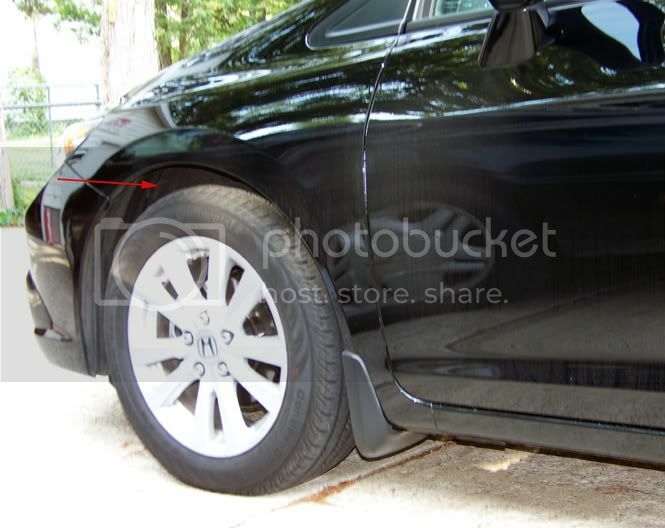 BE CAREFUL with this step fellas....not fun to have a lowered car that looks good with your face looking like it went through 10 rounds with Mike Tyson! 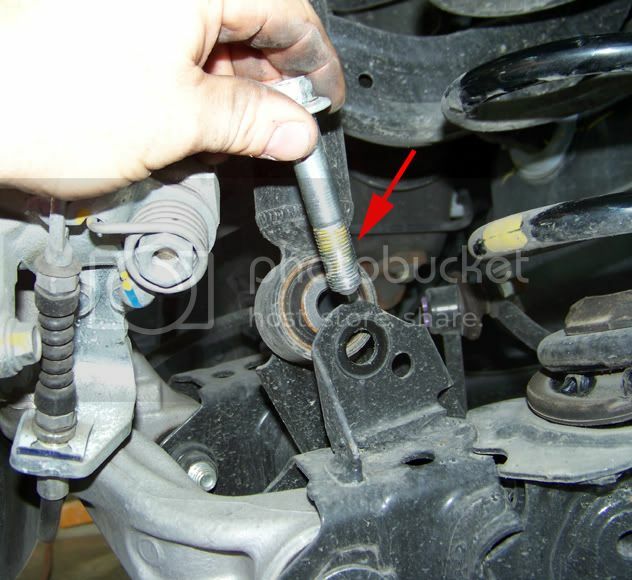 Ok, you'll need to have a little muscle for this step as it will require you to pull down on LCA and whatever is needed to get the spring out. 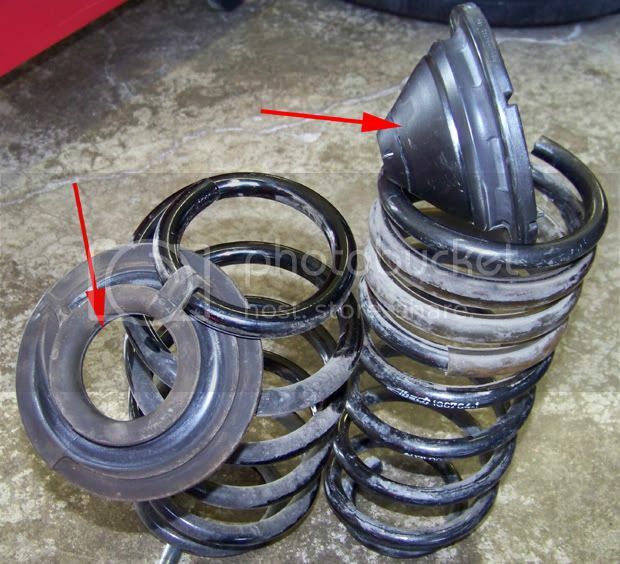 You'll need to make sure that you keep the lower factory rubber piece for the new springs....DO NOT remove it!! 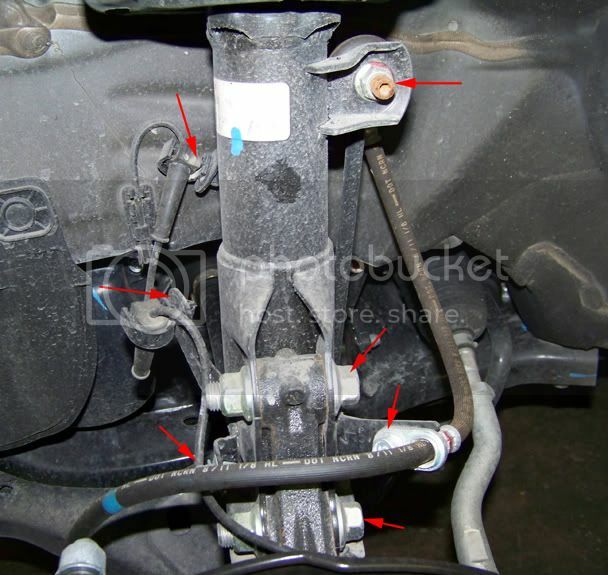 I also marked in BLUEthe rear sway bar. The reason is you'll need to keep an eye on it. 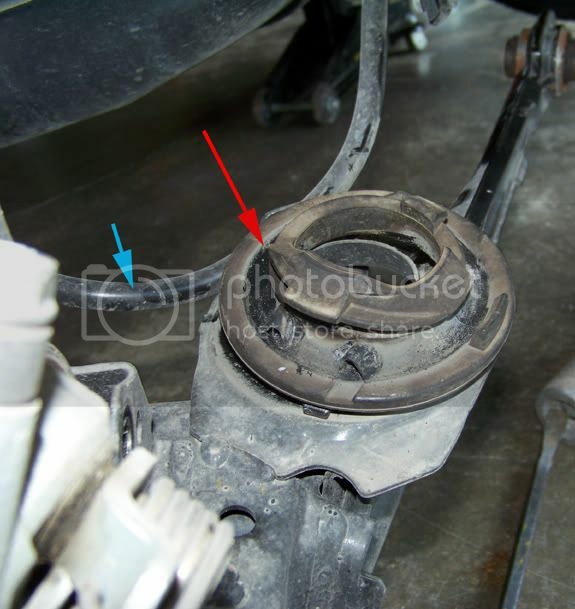 It likes to slip just under the LCA and makes it impossible for you to push the LCA up or down....so make sure it stays out of your way when you begin to put things back....nothing major, just something I ran into as a small correctable issue! Once removed here is what I spoke about in the intro. 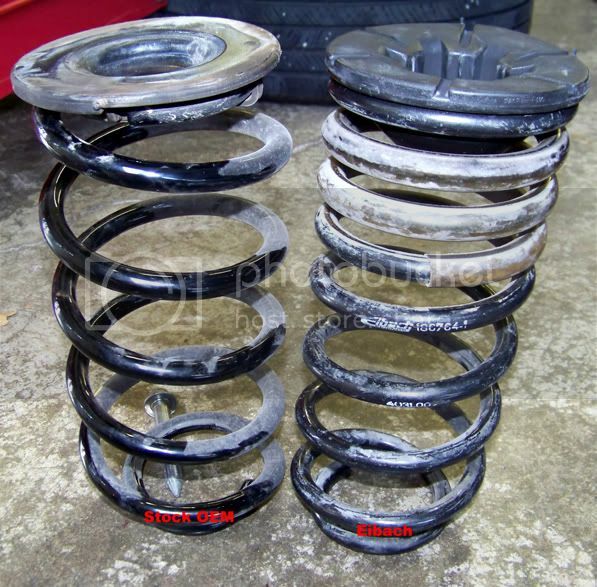 There is a rubber piece that goes on top of the rear springs that needs to be obtained from an 8th gen civic in order to fit your 9th gen (the one on the right of pic). They will be the only two items you'll need to get aside from the springs. 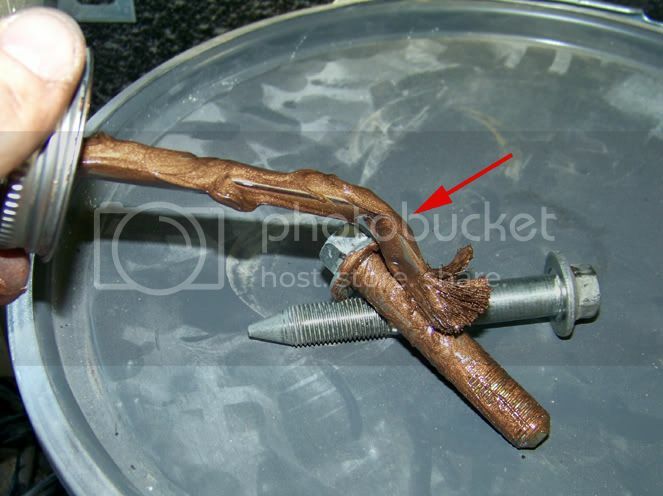 Once you wedge that new spring into place, jack up the LCA back into place and before putting the bolts in use some antiseize for future ease of removal!! 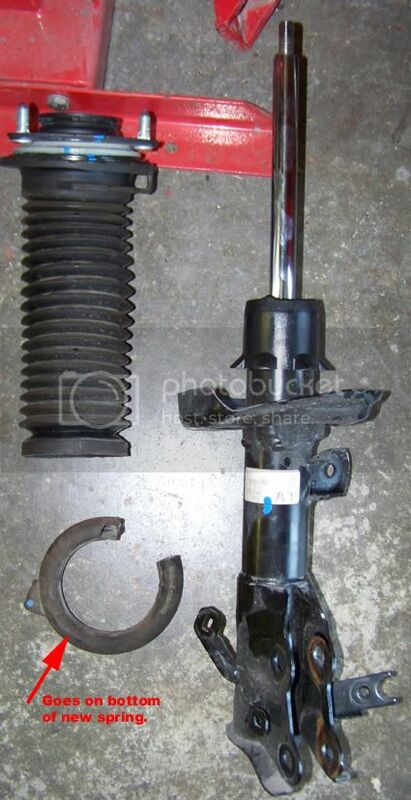 I'm going to add this next step WHICH IS NOT NECESSARY FOR THIS INSTALL UNLESS YOU ARE REPLACING THE SHOCKS!!! 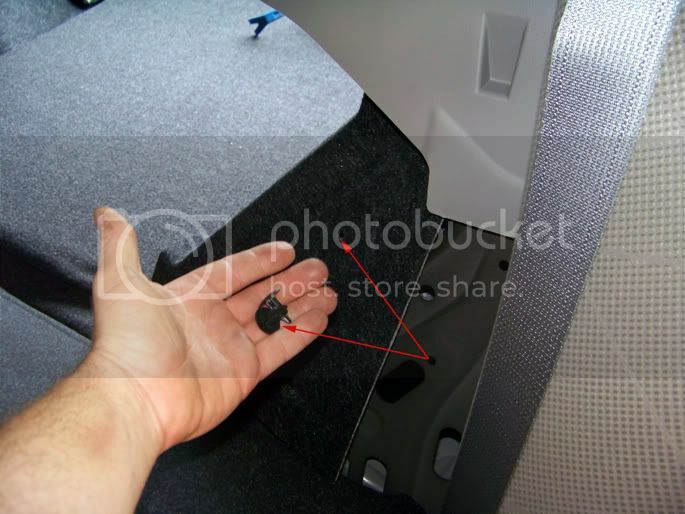 for removing the shock here is what you do.....behind the rear seat youll find one of these. 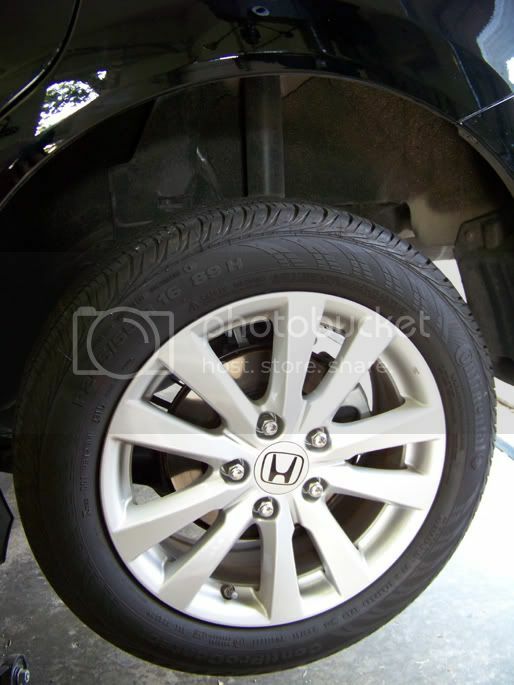 In the trunk area, just underneath the spare tire cover you'll find one more to remove. 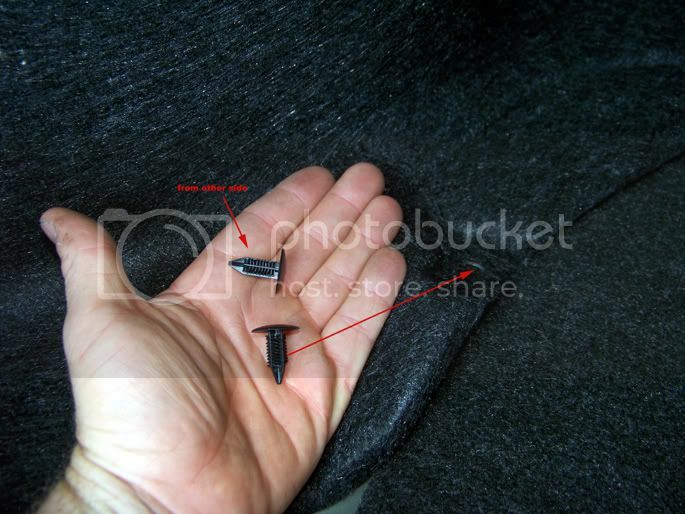 Once you find those two, pull back on the cover CAREFULLY and you'll see what is pictured below. 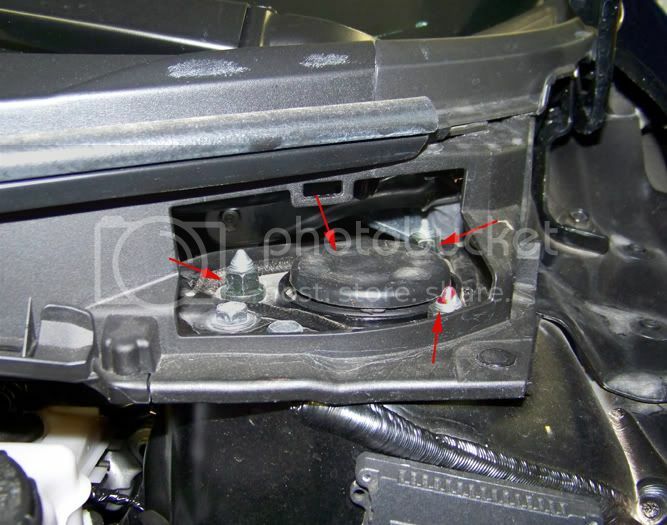 To remove, just take that 14mm nut off and remove bottom bolt underneath the vehicle. 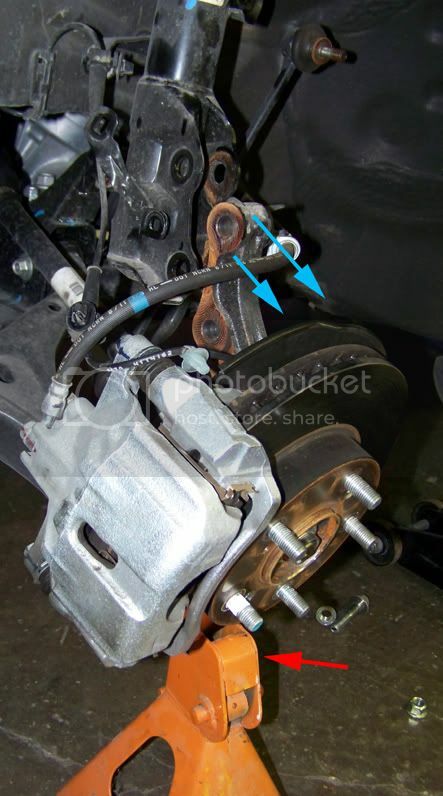 This is simple as heck and should only take a few minutes to put the other shock back in ( whether it be stock, autoparts based or aftermarket performance). KEEP IN MIND THE ABOVE STEP IS NOT NECESSARY IN THIS PARTICULAR INSTALL!! 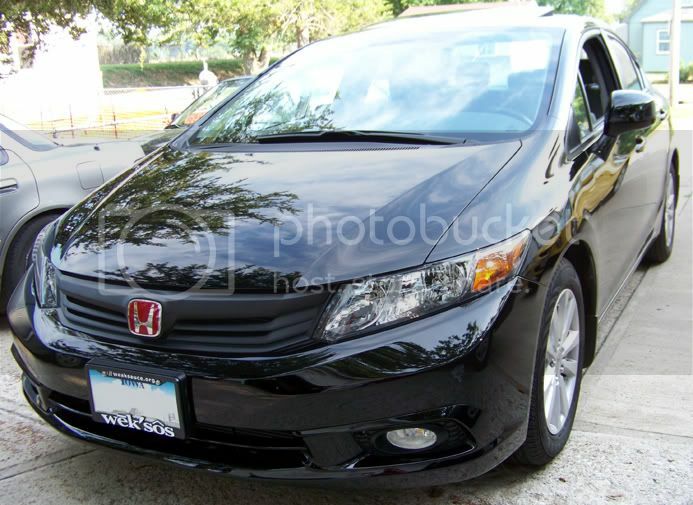 Last edited by importsusa; 07/16/2012 at 06:32 AM. .....THIS ONE WILL REQUIRE the use of a spring compressor. If you don't have one I would suggest getting a hold of me for help!! The ones you can buy or rent at the stores are not always safe and can REALLY hurt you and your ego. 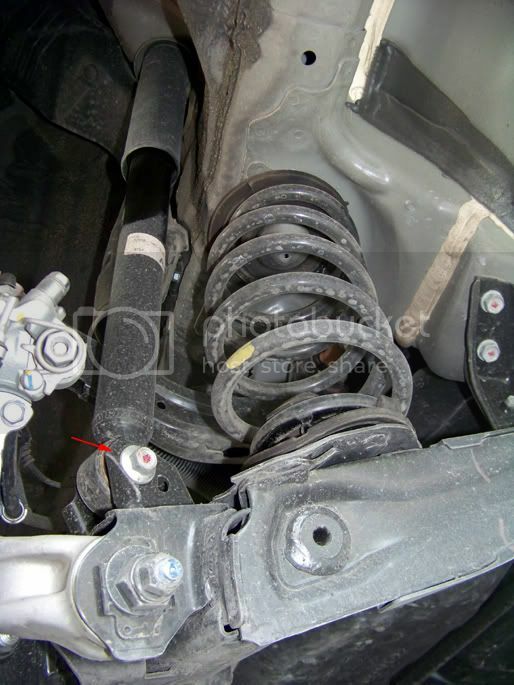 We start by removing any clips, brake lines, bolts that are attached to your shock setup. The arrows below will show what all needs to be removed. There won't be much explanation on these other than bolt/nut socket sizes etc. 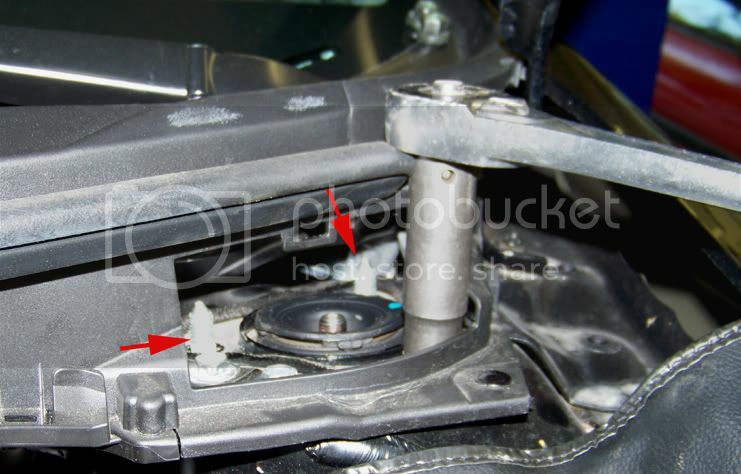 Once you remove the above mentioned you'll have 2 17mm bolts with 19mm nuts to take off from the shock. 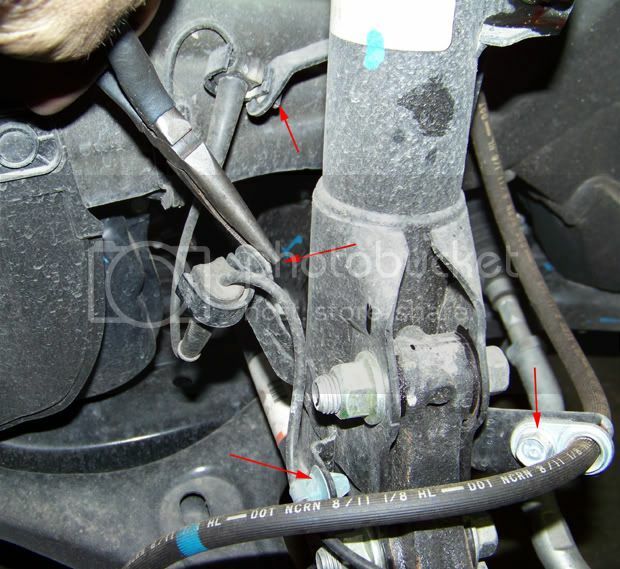 Keep in mind the brake assembly will only be held in place by the lower balljoint so as pictured below with red arrow.....support your front LCA and pull assembly away from shock. 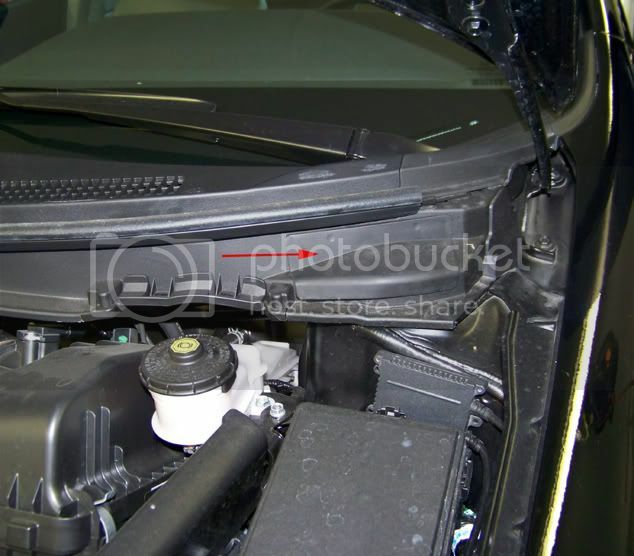 Not pictured above is a small access cover just abovethe third back nut....it is located on your wiper cowl.....helps with removing one of the nuts, the other back nut just under the wiper arms will need to be removed with a 14mm ratchet wrench........otherwise you will never get it off. As for the front one a simple socket will do. 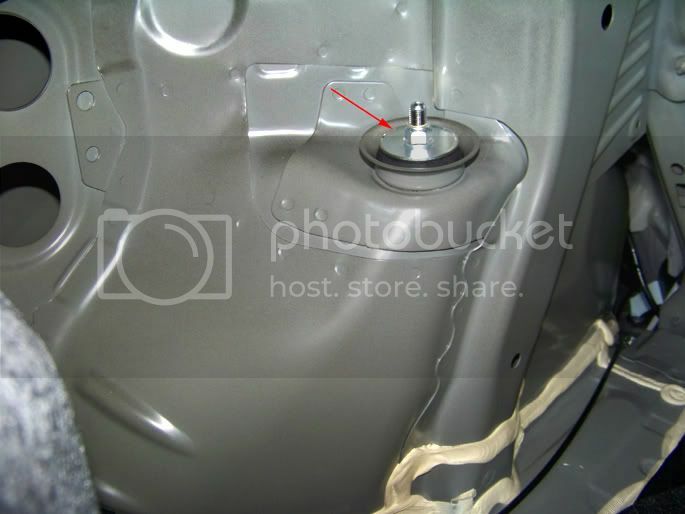 Make sure to remove the two back nuts first and the easier one LAST!! 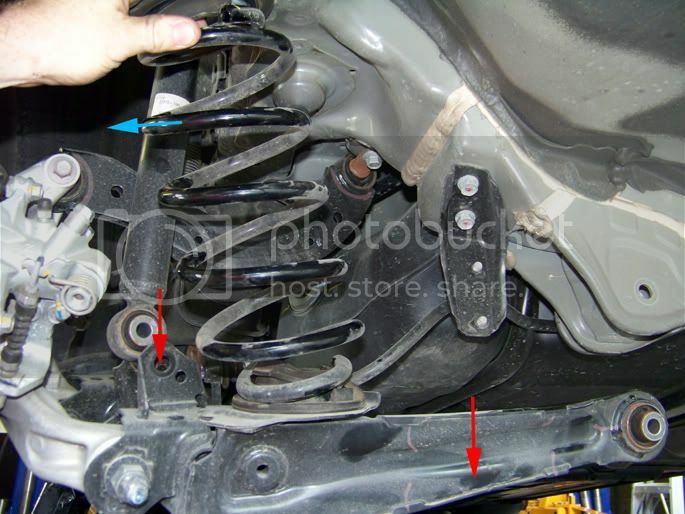 Next steps are to be performed by someone with equipment that can help compress the springs. Feel free to stop everything at this point, gimme a call and I can get this step done for you here at the shop!! Mark your top hat and shock with a line or guide to ensure when removing it all, that everything lines up to where it all was before. With the spring compressed and components off (such as the 17mm nut up top etc.) All you need to use from the old setup will be pictured below. 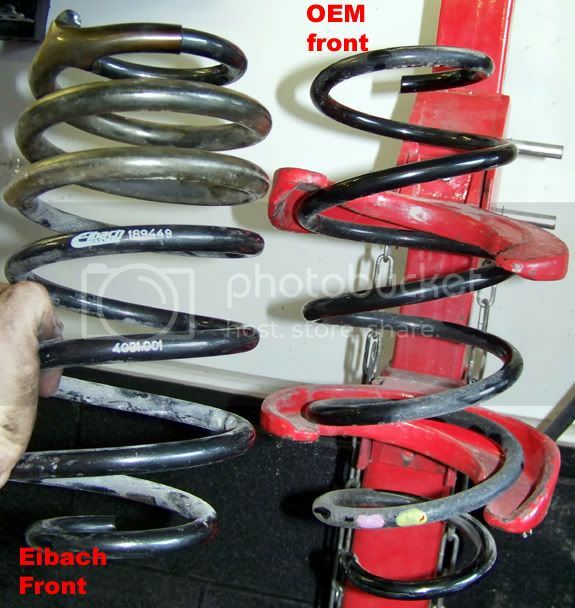 The cool thing about the Eibach spring is that when installing it, it is not really required to compress the spring........so you can easily put it together. If you intend on bringing it to me though, I can take care of it all at once so installing it will be easier when you get home. Once all that is done just reverse install and get it all back on and torqued to specs. 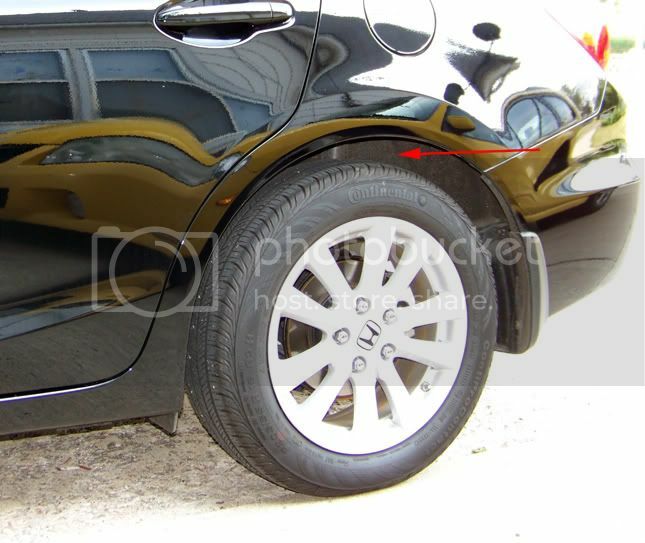 Below are the before and after shots.............Hope you enjoyed this thread and happy Wrenching!! 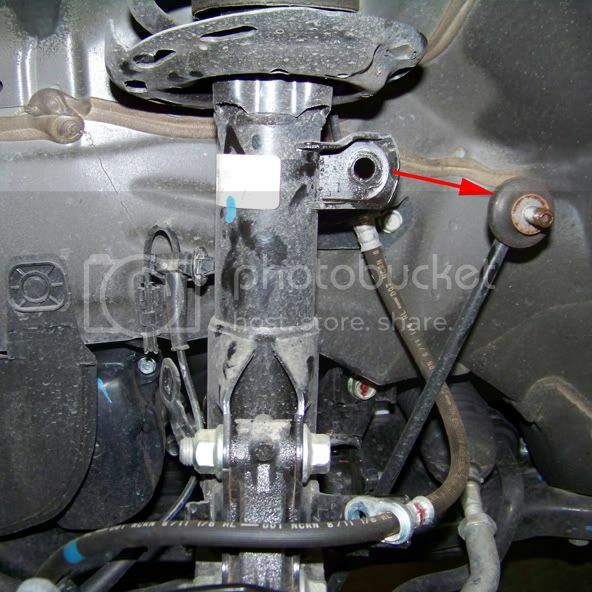 i 2nd on the removing the inside bolt for the upper front strut. i lost a brand new shiny nut , had to buy new one at honda cost of almost $4!!!! for a effing nut. Any one thought about using Fit Suspension on this? When i did my buddy Anthony, Looks identical to this whole set up. Even the location of the fronts . and rears. Im pretty sure no one have not tried. 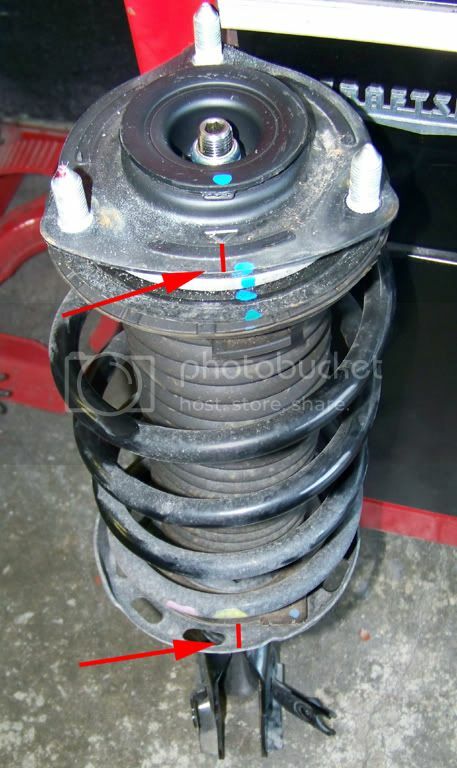 When i use be on the 9thgencivic forums someone did mention that they are identical but it maybe wont work lol i know the 8thgencivic suspension will work if your using springs for the rears all you need the the 8thgencivic rear top rubber isolator as for coils same for rear but for the front you will need to lose the front sway bar.